Are you looking for a reliable plumber in Leeds who doesn't charge a call out fee? 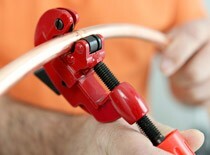 We are a locally based plumber whos total focus is on affordability, punctuality and reliability. We offer clients a comprehensive range of plumbing services and we're known for our high quality workmanship and our prompt reliability. If you need a Leeds plumber who can assist you with any plumbing or heating related job, call us today. We offer all clients very competitive rates on all kinds of plumbing jobs, meaning our service is affordable to everyone. Best of all, we can normally have one of our qualified plumbers with you the same day that you ring - and we won't charge you a call out fee. Call us today. So, try your local plumbing specialists today on 0113 370 9115 and get us in! If you have a question or query, or to arrange a plumber, pick up the phone and call. We think it's unfair to charge customers a call out fee, so we don’t charge one. Call us and we'll send out a plumber at a time to suit you. No matter where you are in the Leeds area we can help you. Whatever you need a plumber for, from a dripping tap to a new bathroom, get in touch today.